On August 9, 1974, Richard Nixon became the first President in American history to resign following his televised announcement the night before. After two years of bitter public debate over the Watergate scandals and facing almost certain impeachment and removal from office, Nixon bowed to pressures from the public and leaders of his party to resign. 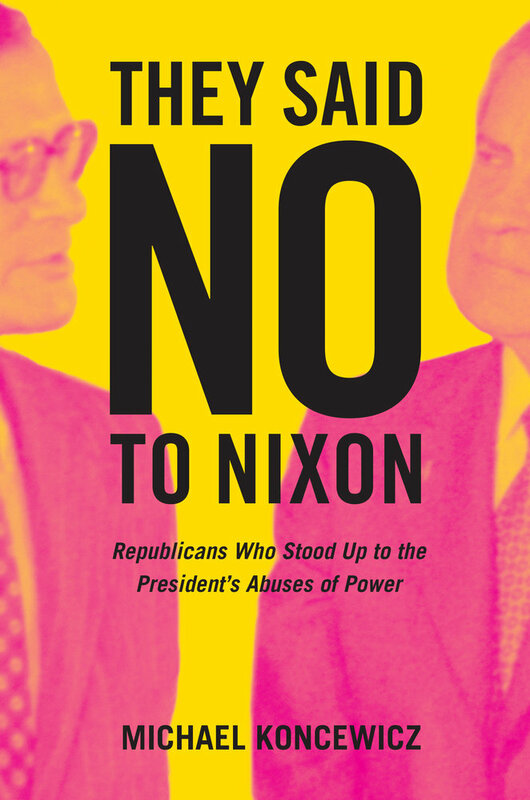 While many are familiar with the Republicans who turned against Nixon during the final stages of Watergate, They Said No to Nixon uncovers for the first time those within the administration—including Nixon’s own appointees—who opposed the White House early on, quietly blocking the president’s attacks on the IRS, the Justice Department, and other sectors of the federal government. Culling from previously unpublished excerpts from the tapes and recently released materials that expose the thirty-seventh president’s uncensored views, Michael Koncewicz—a former Nixon Library employee—reveals how Republican party members remained loyal civil servants in the face of Nixon’s attempts to expand the imperial presidency. 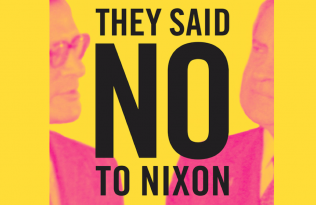 The following excerpt from They Said No to Nixon (publishing October 2018) looks at the president’s rants, his demands for loyalty, his views of masculinity, and his willingness to abuse his power. In an attempt to counteract cartoonish depictions of Nixon in popular culture, some scholars and media figures have recently attempted to dismiss the importance of the White House tapes in assessing his presidency. “He needed to vent and blurt—cut that damn agency in half!—before settling down and shrewdly estimating what was possible and what was not,” argues Evan Thomas in Being Nixon: A Man Divided. This broader view of the White House tapes obscures the fact that Nixon’s “blurts” were sometimes the starting points for many of the White House’s plots to control and politicize the administration’s bureaucracy. When it came to trying to use the federal government for political purposes, Nixon was firmly at the center of many of the White House’s operations. Those who study Nixon must confront the fact that his private conversations were often the driving force behind many of his staff’s more sordid schemes. There were times when Nixon’s rants led to real action. The president’s anger was also emblematic of a deep division within his own administration over the White House’s attempts to fully institutionalize its abuses of power during Nixon’s first term. The president’s vision of a government where he could more readily punish his enemies never came to fruition, but that was only because of the Republicans who said no to Nixon. While many are familiar with the Republicans who turned against the president during the final stages of Watergate (Barry Goldwater, Hugh Scott), there were also Republicans within the Nixon administration who opposed the White House without the limelight that others received. The substantial resistance that the president faced from the IRS was not the only case, as several other Republican appointees also opposed Nixon’s attempts to politicize their work and dramatically transform their offices. Well before the American public became aware of the White House’s dirty tricks, there were Republicans who quietly blocked Nixon’s orders and provided an important, yet fragile, check on the imperial presidency. Although many others within the White House followed through on Nixon’s dirty tricks to varying degrees, some had enough courage to resist the White House’s plots to further expand the power of the presidency. 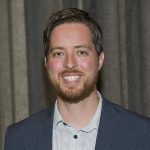 Officials within the newly created Office of Management and Budget (OMB) said no to the president’s orders to cut federal funds to universities. Elliot Richardson and his staff also resisted the White House while they were at the Department of Health, Education, and Welfare (HEW) in small battles that mostly stayed out of the public eye. They later famously stood up to Nixon during the Saturday Night Massacre, a crucial turning point in the Watergate saga, but a moment that was also rooted in Richardson’s previous conflicts with the White House. . . . 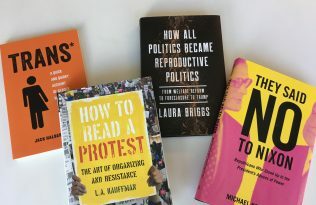 Focusing on these acts of resistance sheds new light on not only who Nixon considered to be his enemies, but also on who he believed would be a part of his “new establishment.” In numerous White House meetings, Nixon criticized the post–New Deal liberal establishment that over time had shaped much of academia, the mainstream press, and the federal bureaucracy. 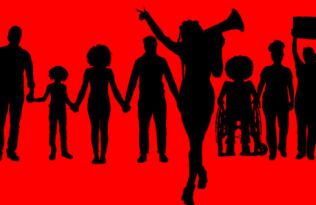 Although Nixon’s “new establishment” was never fleshed out in terms of its ideology, it was meant to stand in opposition to the liberal establishment, the American left, and the dramatic cultural changes of the late 1960s and early 1970s. Nixon’s brand of conservatism was primarily defined by what he opposed. This was true throughout his political career, from his anticommunist crusades in the 1940s to his persistent attempts to enhance the powers of the Oval Office. In the absence of a well-defined ideology, Nixon often adhered to a Manichean form of cultural conservatism when dealing with his opponents in his public campaigns, but also in private. Since he firmly believed that his presidency was under attack by his enemies, administration officials who refused to carry out his orders were quickly labeled as a part of the old “establishment.” They had violated a core part of his new establishment—loyalty to his presidency. This culture of loyalty was at the center of what eventually led to Watergate. In addition to viewing any type of resistance as a blatant example of disloyalty, Nixon was quick to question the masculinity (“toughness”) of officials who showed any signs of hesitation in carrying out one of his orders. Listening to the White House tapes, one can often hear the president directly tie an individual’s loyalty to the White House to his crude understanding of masculinity. Whether it was labeling the federal bureaucracy as having “no guts,” concluding that the nation’s intellectual and political establishment had “gone soft,” or demanding that the new head of the Bureau of Labor Statistics be someone “who has balls,” Nixon regularly used gendered terms that denoted his need for more masculine individuals in his administration.4 While these types of conversations have sometimes been dismissed as Nixon’s desperate attempts to sound tough, it should not be ignored that Nixon’s simplistic views on masculinity and loyalty had an impact on how he governed, especially when dealing with internal resistance. . . .
For Nixon, taking action to harass and even punish his enemies was a true sign of masculinity. It would prove whether a member of his administration was either a “tough guy” or a “nice guy,” whether that individual was with “us” or “them.” Despite their many past instances of showing loyalty to the president, officials such as Elliot Richardson and George Shultz were consistently dismissed as weak whenever their independent streaks got in the way of the White House’s plans. Richardson and Shultz did in fact receive prestigious cabinet posts, but they were mostly appointed to these posts because of the prestige that they brought to the administration. This sense of prestige was often connected to their reputations as Ivy League–bred experts who had ties with Washington’s political establishment and / or social scene. Once they were appointed, they were expected to follow through on Nixon’s demands and exhibit a certain level of toughness. There was an almost automatic tension between these types of presidential appointments and the White House’s more nefarious plots. 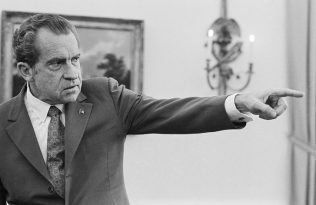 When Nixon unleashed an illegal order, it was a test of that particular individual’s loyalty. . . .
Nixon’s heightened sense of loyalty, combined with his skewed understanding of masculinity, eventually led to the development of a bunker mentality that persisted throughout much of his presidency. Although he began his presidency with a healthy amount of ideological diversity, with a significant number of liberal and moderate Republicans in high-level positions, that mentality eventually led to the diminishment of dissenting voices. By the end of his first term, Nixon’s growing suspicions about some of the less politically inclined moderates who did not aggressively pursue the White House’s enemies turned them into his enemies as well. The president came to the conclusion that they were not fit to lead in the White House’s war on the “establishment,” including its enemies in the media, the antiwar movement, and even those who were embedded within the federal bureaucracy. . . .